It was one of those days... everything started out so nicely with a tasty breakfast, an early morning ride in the car and then a leash-free run at the baseball field! Running free we dug our paws into the soft outfield grass kicking up blades behind us as we tore from one side to the other. Dashing across the infield the red dust was flying like a herd of buffalo on the horizon. People on the outside of the field stopped and pointed at us, cute little white fluffs bouncing after one another, literally having the time of our lives! With this exceptionally warm, chamber of commerce, San Diego day the two of us were soon panting, our little pink tongues hanging to one side and we plopped into a nice, cool, wet spot in the shade. After a quick drink of water we popped back into the car and headed home for what we thought was going to be a much needed nap on the cool tile floor. Then it happened... they took our collars off. Never a good sign. They carried us up to the bathroom and before we even had a chance to run the other direction we found ourselves knee deep in luke-warm water. We were doused, soaped and then rinsed. How could such a wonderful day go so bad so quickly?? As the "guys" took their much awaited nap I headed into the kitchen getting a head start on dinner. With a hearty bean soup on the stove, a nice biscuit on the side seemed to be the perfect complement. Filled with sharp, grated cheddar cheese and a handful of chopped scallions these savory, tender and airy biscuits had me quickly reaching for seconds! Patting myself on the back for my productive day along with some of the best biscuits I've ever made, I looked at my feet to find 4 big brown eyes and two little black noses staring up at me. Scooping the fluffy pups into my arms we settled in for a snuggle filled with happy puppy kisses. Life is Good! Whisk together flour, baking powder, sugar, baking soda, and salt in a bowl, then blend in butter with your fingertips until mixture resembles coarse meal. Stir in Cheddar and scallions. Add buttermilk and stir until just combined. Drop dough in 12 equal mounds about 2 inches apart onto a buttered large baking sheet. Bake in the middle of the oven until golden, about 17 to 20 minutes. Alternatively, pour dough out onto a lightly floured surface and pat into a 1/2 to 3/4 inch thickness. Using a biscuit cutter (or a small cup or can) cut the dough into rounds and place onto a baking sheet lined with a silicon mat (or sprayed with cooking spray). Serve biscuits warm with butter. Note: My biscuits seemed to cook on the fast side, check often! Biscuits are best the day they are made, but they are still good the second day reheated for a few minutes in a toaster oven. These look incredible! In fact I am going to make them this week. And your dogs are so adorable. I don't know what's cuter: the puppies or the biscuits....oh those puppies. I need to go give my kitties some cuddles 'cause now I'm in pet-cuddling mood. And I need to make these biscuits! 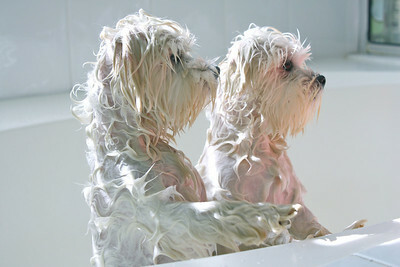 Kim, this was a fantastic idea :-) Your dogs are too adorable! I'm glad one of us is enjoying this weather; it's wreaking havoc on my touchy skin :-( Some cheddar scallion biscuits would help me forget my skin issues! Mmm how I love biscuits. 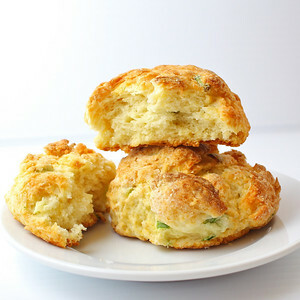 I love the addition of scallions in the biscuits, they sound soooo good! Oh, I love those puppies, they are so cute!!!! Your biscuits look delicious. Thank you for sharing! Your puppies are so cute and the biscuits, mouthwatering. I have to make these biscuits. 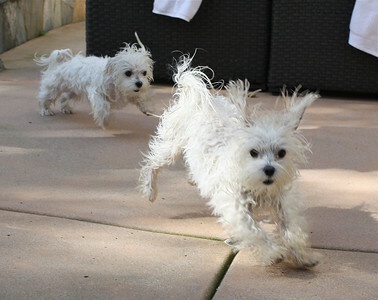 I love the picture of their ears flapping in the breeze. My Bailey looks the same way, when she's running full speed around outside. your fur babies are beautiful, what sweet companions you have, my Berners would love those little guys! Your biscuits look delicious and I have been craving biscuits lately, and those lovelies would certainly hit the spot! Liv your furry babies are so cute. And how lucky are you to be living in sunny San Diego! Those biscuits look so good. Those are the cutest doggies evah!! Wonderful post - so cute. And the biscuits are making my mouth water - they look sooooo tasty! All the pictures are fabulous! I love the biscuits and that one shot of the pups in particular. Love this post! Would love some of the biscuits for afternoon tea. 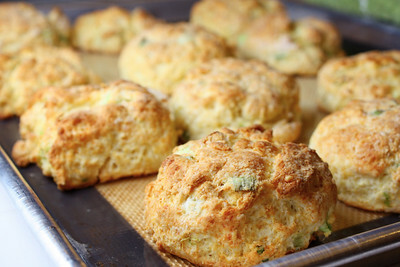 Those savory biscuits sound excellent with cheddar and scallions! Such adorable puppies! How funny! The pictures tell it all, and your pooches sure know how to tell a story. The biscuits looks awesome and perfect for a nice hot bowl of whatever. :) Have a great day Kim! Those are two very adorable pups!! and the biscuits sound amazing. Perfect for a winter day (we got a fresh foot of snow here!). omg your babies are so cute... it must of been hard to snap a shot of them like that. My puppy won't sit still when I bath him. Your pups are so sweet. I wanna come over and play with them. And I'd like some of your Cheddar spring onion biscuits. A recipe where I already have all the ingredients necessary to make them! I love days like this! Oh and those dogs are adorable!!! LOL that is soooo cute that you started your post blogging as if you were the puppies!! So so cute and the pictures are ADORABLE!! And your biscuits look and sound incredible! Can't wait to give these a try- they sound perfect with soup or stew on these cold nights. This is just wonderful post! Picture perfect photos, and recipe is amazing! I love how you started this post from the puppies' perspectives. So cute! And so are they! I've tried tossing the cat into a tub of water but he quickly hops out and shakes his paws to get the water off. Those biscuits look delicious too! An outing with the pups and some cheddar biscuits later? *drool* The weather in Vegas has been wonderful too so I don't blame you for getting out. At least everyone had fun! I just melted with those photos of your babies. They are sooo precious. I even made one of those oooooh noises with the dilated baby-goggling pupils. That's how adorable they are. 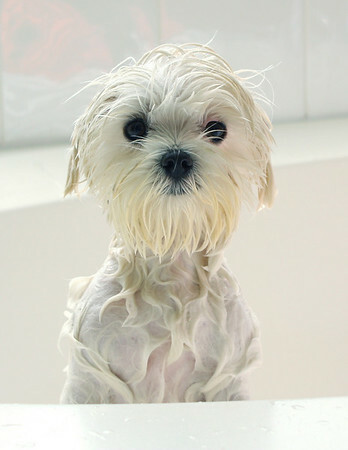 Just love those bathtime pics. Bless their little hearts. And those biscuits, heck, those are a post all to themselves. Wonderful job Kim!! Haha I love the pictures of your puppies... to cute! Kim, I'm not even a dog person and these pictures made me laugh out loud. They are so adorable! I could hardly even pay attention to the biscuits which also look great. The doggies stole the show. That is amazing. I would like a one...or two...right now!:). thanks for sharing this awesome recipe ..
the puppies are adorable and those biscuits sound delicious. They were wonderful! Thanks for another great recipe!